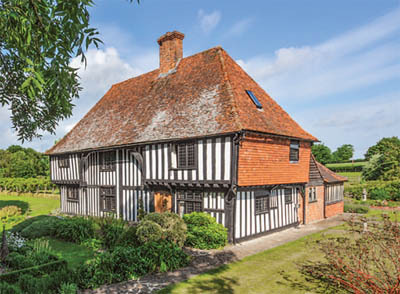 Little Hearnden is a Wealden Hall house dating from 1493 which has all the classic features of this very English period style. Listed Grade II, the house is presented in immaculate standard by the owners, and is thought to be one of the finest surviving examples of its kind. The interiors are blessed with a good deal of character and reception rooms include inglenook fireplaces, polished oak timbers and a rare original oak screen. The study, for instance, has a dragon beam, leaded light windows and a small fireplace. The first oak staircase leads to the first floor landing, while a further oak staircase rises to the second floor which features a galleried landing and spacious sitting area. Accommodation in total comprises: hall, study, drawing room, dining room, kitchen/breakfast room, garden room, cloakroom, five bedrooms and a second-floor sitting room. Outside, the grounds come to nearly seven acres and the gardens are very impressive with a long, wisteria-covered walkway, and a fenced pond at the front of the house, as well as a knot garden with box hedging. The terrace sits to the rear, with lawns and colourful borders. A range of recently built outbuildings sit near the entrance gates including a barn and four stables. The paddocks are wrapped around the gardens. Little Hearndean is located off a quiet rural lane surrounded by the Wealden countryside, equidistant between Headcorn and Sutton Valance, both of which have good local facilities; Headcorn has a mainline rail station to London. The guide price is £1.25m. For further information please contact Strutt & Parker on 01227 451 123 or visit www.struttandparker.com.